Futuristic floating cities seek to provide a solution to many of our environmental problems, like rising sea levels, increasing temperatures and dwindling resources. Recently Japanese building firm Shimizu Corporation unveiled plans for a completely self sufficient floating ecotopia that is covered in vegetation, generates its own power, grows food, manages waste, and provides clean water. Shimizu Corporation has been hard at work coming up with some pretty crazy concepts lately, and Green Float, the Environmental Island is one of them. Designed for the equatorial pacific, presumably near Japan, Green Float is a concept for a series of floating islands with eco skyscraper cities, where people live, work and can easily get to gardens, open space, the beach and even “forests”. Islands are connected together to form modules and a number of modules grouped together form a “country” of roughly 1 million people. 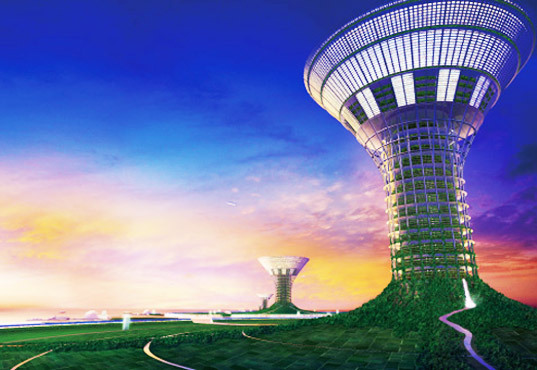 A 1,000 m tower in the center of the island acts as both a vertical farm as well as a skyscraper with residential, commercial and office space. The green space, the beach, and the water terminal on the flat plane of the island are all within walking distance. Energy for the islands would be generated from renewable sources like solar, wind, and ocean thermal, and they also propose to collect solar energy from space, presumably from their own crazy idea to install a solar belt on the moon. QUOTE \"Futuristic floating cities seek to provide a solution to many of our environmental problems, like rising sea levels,\" Bouyancy works by displacing the same volume of water as the weight it supports....?? where do you think this water will go? ?..By building this you will add to the raising of the sea levels...If you want to help stop raising sea levels stop building anything that floats...VLCC supertankers included!! What a concept! Hope I live long enough to see it become a reality. Hm. Where have I seen this before. Oh yes, I remember. The Millennial Project, circa 1992. http://en.wikipedia.org/wiki/Space_Enviroments_Ecovillage I was quite fascinated with the concept while I was in college. I remember reading and re-reading the book (The Millennial Project) several times during my college years. 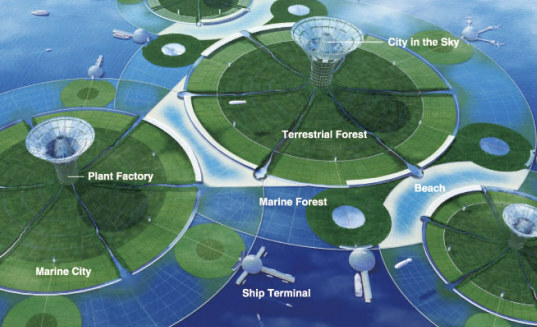 Artist representation of Aquarius (floating cities using Ocean Thermal energy generation) http://lufwiki.pbworks.com/f/plate4.jpg Seems everything old is new again.